Business Continuity Management (BCM) is a management process that identifies potential threats to an organization and the impacts to business operations if those threats are realized. 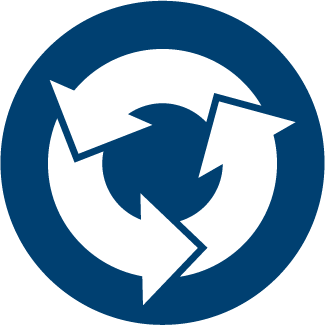 Continuity of Operations Planning (COOP) is a similar system designed for continuity of government operations or the “public sector.” Both systems provide a system for enhancing the resilience of an organization. There are standards that provide requirements and guidance for designing and implementing a Business Continuity Management System. There are also additional technical specifications available. 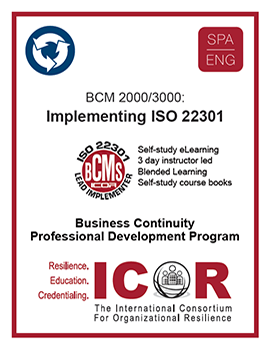 The ICOR courses in the BCM Discipline teach how to align, implement, and audit to BCM programs using ISO 22301. The variety of courses offer education for beginners, for those with experience, and for those looking to grow professionally by learning how to audit or prepare to be audited. Audience: Those new to BCM, those responsible for developing and managing a BCM program, or for consultants. 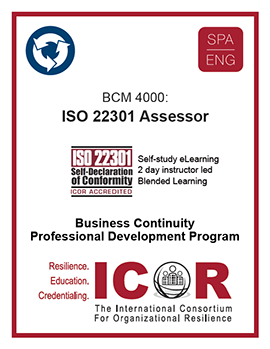 Description: Whether you choose the eLearning or the instructor-led course, attendees will learn how to develop and manage a BCMS that is aligned to ISO 22301. Included in the course materials are case studies, multi-media, small group activities, games, and takeaways such as sample policies, a BIA/Rick Assessment tool, and templates. 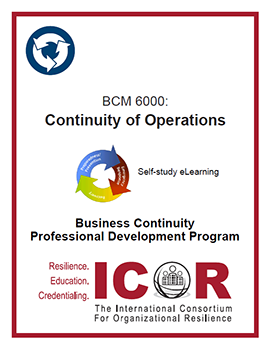 Description: Using a case study approach and the ISO 22301 Maturity Model Assessment tool, participants learn how to conduct a self-assessment of an organization’s Business Continuity Management System. The self assessment tool is included in the course (value $995.00). The Self Study does NOT include the self assessment tool. Description: Provides the skills and knowledge to conduct and lead effective BCMS audits in accordance with the requirements of ISO 22301, 19011, and 17022. 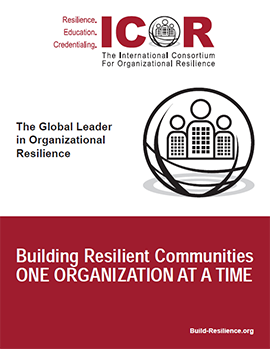 Audience: Those who work in emergency management or in government who are interested in creating or improving a continuity of operations program. Description: Continuity of Operations is both intensive and practical, with participants developing continuity of operations programs at their own organizations during their studies. This approach melds theory and practice to provide the student’s own organization with the outlines of a Continuity of Operations Plan. Included in the course materials are multi-media, games, and takeaways such as sample policies, plan templates and more.